Before I even really fell for bluegrass, my ear found this odd stringed instrument called a dobro. It's a guitar that is mostly played with the instrument in a horizontal position, while the instrumentalist plucks with one hand and guides the other up and down the neck wearing a special finger guard of sorts. It has a resonator, which amplifies the sound in a certain way. I thought it was a kind of steel guitar, or some other country music type fad. I remember hearing a cut on the Alison Krauss + Union Station Live cd, a tune called Chocktaw Hayride, featuring the instrument. At the time, I was in my kitchen, and I had to stop whatever messy project I was into and listen. The performer was Jerry Douglas, who's name is of course synonymous with dobro and who has used the instrument to push the musical envelope much like Bela Fleck has introduced banjo into realms well outside of bluegrass. 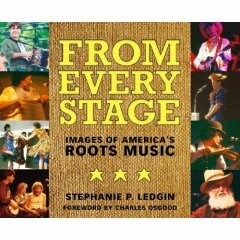 Stephanie's book shares the secret of the dobro, so, seeing as the subtitle of this blog is, "And You'll Learn Something If It Kills Me," I figured I'd share it with you. The instrument was designed by a Slovenian immigrant, John Dopyera, who with his brothers, Rudi and Emil, founded the National String Instrument Company in Los Angeles. 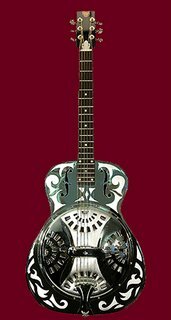 The Dobro, for Dopyra Brothers, was introduced in 1927. This unique guitar with its own amplification system was intended to bring a bigger sound out of the guitar in a group setting, but was overtaken by the first electric guitars. The dobro (a model pictured here was a Dobro Brothers creation from the late 1920s) became popular in bluegrass bands in the early 1940s and today it is a hallmark of several bands, Krauss' Union Station foremost among them because she's got Jerry Douglas. So the next time you fancy to take in a bluegrass band, keep an eye out for the Dobro. And if you're looking to get the basics, order up Steph's book or ask the library to get it. 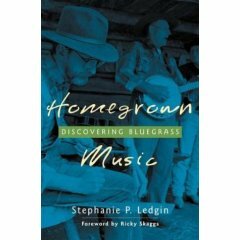 It's a fun read, chock full of charming stories and little-known historical details presented in a way that reminds us that bluegrass is here and now and ever shall be. do you like Nickel Creek any? Love them! They are an extraordinary collection of young musicians that really push the envelope. Jerry Douglas has played with them many times!